The University of Louisiana at Lafayette is located in Acadiana, which is the cultural center of Louisiana’s heritage. Here, a variety of diverse cultures come together to make a lasting impact in our local community. Many of our students come from the surrounding area, but even those from other states and countries learn to love the Lafayette area as their home away from home. • 2% are two or more races. There is also a great deal of gender diversity in the surrounding Lafayette area. Women make up 51% of residents, and 49% are men. Additionally, 3% of residents in the Lafayette area are foreign-born, bringing to the community a mix of cultures from around the world. With such a rich heritage of Cajun and Creole cultures in the Lafayette area, as well as a growing population of foreign-born citizens, it is no surprise that 16% of Lafayette area residents speak a language other than English at home. Check out our Intensive English Program to learn more about our services for students, scholars, professionals and visitors from around the world. 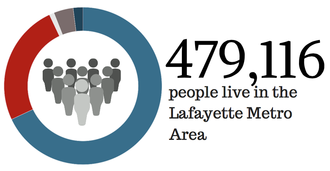 Veterans make up 7% of the population in the Lafayette metro area. Check out our Office of Veteran Services to learn more about our services for veterans. Education is very important within the Lafayette and surrounding community. In fact, 80% of Lafayette area residents have attained at least a high school diploma. UL Lafayette is committed to helping prepare K-12 students for college. Check out the GEAR-UP program for more information. Learn more about other resources serving the community by visiting our Community Organizations page.